TPD Drake ( Formerly Larry), Tom Bond with TPD Eyke, Course Instructor Steve Dutton, Kevin Roberts with TPD Bill and Brenan Trent with TPD Ben. This wasn’t the line-up that started the course on Monday 7th January. 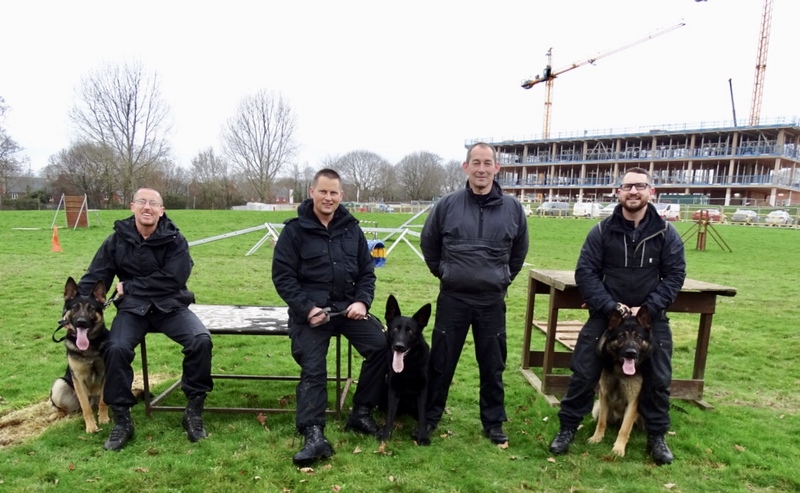 We started the course with Brendan and TPD Ben, Tom with TPD Sydney and Kevin with TPD Bill. Unfortunately in the first few days of the course TPD Sydney developed an extreme reaction to going onto certain types of floor surfaces in our training building. This could be a reaction to stress or the development of a visual fault. This meant that we had to remove TPD Sydney from the course for further investigation. Tom was allocated replacement TPD Eyke to continue with the course in week 2. Tom and TPD Eyke are pictured here on the right with the other 2 dogs who started the course Bill and Ben. In week 3 we had an unexpected addition to the course with Mark Stevens and TPD Drake ( formerly Larry). 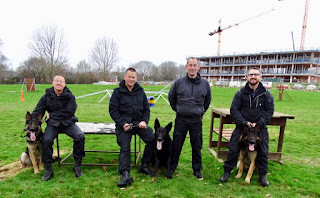 The eagle eyed blog followers amongst you are probably wondering why Mark is back again having only just completed an Initial course with PD Brock in December 2018. I will explain why later in the blog. The General purpose Initial Police dog course is without doubt the most demanding and challenging Police dog course that there is. The teams are trained to master a wide range of skills and tasks. These include Searching and tracking for outstanding offenders and vulnerable missing persons, confronting and dealing with disorderly crowds, violent criminals and, locating lost or stolen items of property. Here is Brendan and Ben hot on the trail of an offender. To achieve all of this the handlers need to develop the stamina and agility of their dogs and to maintain an incredible level of control over their dogs. Here is Tom working with Eyke on achieving focus on his handler. This is all achieved by developing a strong bond through play and by breaking the exercises down with patient repetition until the dog understands what is required. Here is Kevin working with Bill on negotiating obstacles. Let me introduce you to the individual teams. I will also describe how the dogs all got to this point ie via the most important people in this process the puppy walkers. 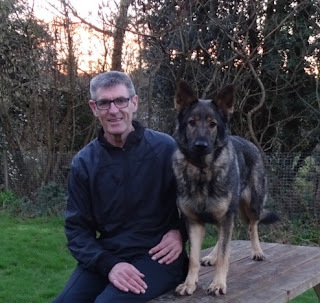 Brendan is an experienced Police dog handler who is based in Ferndown Dorset. His last dog PD Vinnie from our puppy program retired recently after 6 years’ service. They certainly were not affected by the journey and they played in the garden as if they had always been there. Their allocated puppy walkers weren’t able to take them for a few days and so my reliable helpers Mary and Margaret stepped in to help out. Despite Ben being a very active highly driven dog with a propensity for attempting to chase cars puppy walker Lyn managed him very successfully. Here is Lyn practising with Ben on the ramps for the Devon County show. Here is Ben being introduced to his first lesson on following a trail. He was a natural from day 1. Unfortunately at around 6 months Lyn developed some health issues and was unable to continue looking after Ben. Obviously this was very upsetting for Lyn but she should not be too hard on herself because she certainly more than played her part on Ben’s journey. Here she is with Ben on the right at the Devon county show. Wendy and the kids are extremely active and certainly kept Ben busy. By now Ben had grown into a very powerful dog and was starting to go through his adolescent stage. So my first job was to demonstrate to his new puppy walkers how to walk him on a lead and how to prevent him trying to get to other dogs on his walks. With a big powerful overzealous young dog like Ben these skills are essential because being dragged around everywhere is never enjoyable. They came to all of the training sessions come rain or shine. Ben is a dog with a lovely temperament but he is an extremely powerful dog with huge energy levels and would be a challenge for anyone. Wendy is only a tiny lady what they have achieved together with Ben has been remarkable. Just before Xmas Brendan came to Plymouth to meet the family and collect Ben to start the next stage of his journey. Ben is thriving on the course and Brendan is delighted with him. Here is a video of Ben doing a multi leg track in only week 2 of the course. I think we can safely say that all of the work and effort put in by our puppy walkers is paying off. Kevin is the dog section supervisor for Ashburton and Plymouth dog sections. Kevin joined the dog section approximately 18 months ago. He is a relatively inexperienced dog handler having handled 2 dogs which haven’t worked out for him during that time. He was allocated Bill in October 2018 and having had plenty of time to bond and gel with Bill we are all hoping that they can now go on and become a successful partnership. They are both enjoying their course together and there is no doubting Bill’s boundless enthusiasm as demonstrated here where he can’t wait to get going on his track. As stated previously Bill has been puppy walked by Chris Highton, his partner Cathy and Chris’s son Jake. I'm sure the majority of Police dog handlers would be very surprised if they could see the amount of work our puppy walkers put into their dogs. Not just in terms of the commitment they give ie 24/7 care but also the training sessions that they all regularly attend. 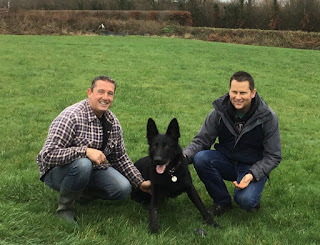 Here are some photo’s of Chris and his son Jake with TPD Bill sowing those early seeds in preparing him for his future role. Chris teaching the sit and down. Chris and Jake practising recalls with Bill. Jake and Bill tracking through the woods. Jake demonstrating a sit stay with Bill. Chris doing a locate and bark with Bill. Bill demonstrating total trust in Jake as he lifts him up. If you want evidence of a bond between handler and dog look no further than the relaxed look in Bill’s body language and eyes. Jake I don’t want to embarrass you but I think you would make an excellent Police dog handler and although your lovely mum Donna is no longer with us I think she would be extremely proud of you. Jake hasn’t seen Bill since he came to the dog section in September last year. But it was fairly obvious that Bill hadn’t forgotten him when he met Jake and his girlfriend Tennielle at HQ last week. Tom is an experienced handler who is based in North Devon. His last dog Bowser retired in December last year and has quickly settled into a great new home with Nicky, her husband and 3 children in Exeter. pictured here with his puppy walker Phil on handover day. Unfortunately because of Sydney’s reaction to certain floor surfaces we had to release Sydney from the course pending further investigation. We then allocated Eyke to Tom to continue his course. We had not planned to use Eyke until September because he is only just 11 months old at this time. But he has quickly settled in and is already showing that this is something he was born to do. His full time puppy walkers had been unable to continue looking after him because of health issues and as we would have needed a new full time walker for him from January 23rd we decided now was as good a time as any for him to start. He is a tough, independent, highly energetic young dog who has a very athletic frame and has found it very easy adapting to the course. It would have been very difficult finding a new puppy walker with the experience and skills to have taken on a dog like Eyke at 11 months. Eyke is from our E litter and was born on the 23rd of February 2018 in our house. From the beginning he had a commanding presence and was clearly the boss in the litter. Here is a video of the litter in the garden with their mum Sasha. Here is Eyke being collected by his puppy walkers Rob and Lisa at 8 weeks of age from our house. You don’t need to be an expert to see what type of character Eyke was going to be from the hard assertive look in his eyes. He has a lovely character, is extremely biddable and his focus and drive make him an easy dog to train in the hands of someone with the experience to channel those traits. Rob and Lisa are first time puppy walkers and without doubt have done a first class job raising Eyke. He has been a challenge but they have persevered and never missed a training session. In addition I have had many one on one sessions with Rob and Eyke to help them along the way. Rob has put in a lot of work getting Eyke to walk sensibly and to reduce the overpowering urge he had to chase anything that moved ie, cars, buses, trains, cyclists, pigeons. Here he is with Rob in the city centre not quite 6 months once again showing lovely focus and walking beautifully. Here is video of Eyke when he was 6 months old walking through Exeter city centre on a loose lead in the heel position ignoring all of the distractions around him. Take it from me this didn’t happen by accident it required a lot of work. Unfortunately Rob’s wife Lisa suffers from Chronic fatigue syndrome and with Rob at work Monday to Friday looking after Eyke was taking its toll. They battled on as best as they could but in early December we placed Eyke with temporary puppy walkers Eamon and Karen until new permanent walkers could be found. Here are the family handing Eyke over to temporary puppy walkers Eamon and Karen on the next stage of his journey. Needless to say handler Tom is extremely happy with Eyke on the course and I am extremely proud of the fact that I bred him. 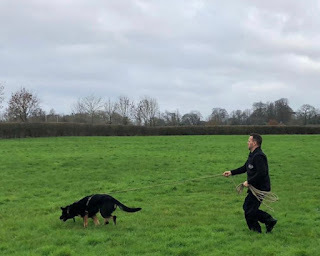 Here are more pictures of Eyke on the course in the early stages of person searching and bitework. Mark is an experienced Police dog handler who is stationed at Ashburton. His last Police dog Axel earned legendary status for his achievements but sadly had to retire aged 5 with a spinal complaint. Mark was allocated a new dog called Brock ( Previously Quest) to replace Axel and he completed a full Initial Police dog course with Brock in December last year. Brock was quite inconsistent throughout the course with regard to the tracking exercise but he did pass his final assessments. Briefly he commenced operational duties with Brock in December but it soon became clear that if he was to become a successful Police dog he would require a lengthy period of remedial work to rectify his tracking performance. Mark is understandably devastated because he was very much loved by his family and he tried so hard to make it work. His instructor on the course Graham Attwood pictured here Instructing Mark and Brock has always been a fan of Brock and recognises that he has too many other good qualities to give up on him just yet. He has volunteered to take him home as part of his family and to work with him for an extended period of time to see if he can improve this vital area of his work. I am grateful to Graham for giving him this chance and wish them both luck. and so the decision was made for him to start again on the current course with a new dog. I feel an element of blame for not identifying this issue with Brock before the start of the September 2018 Initial course. Because I have so much respect for the way that Mark has handled the whole situation and his ability and productivity as a handler I have allowed my own dog Drake ( Previously Larry) to go to Mark. I imported Drake (Previously Larry) from Holland when he was 15 weeks old and just as I have done with countless dogs that I have run on from puppy to adult the first thing I do is to get them tracking from day 1. It is always hard parting with them when they become adults but I draw comfort from knowing they will have the best job any dog could have. Parting with Drake ( Previously Larry) has been the most difficult one yet. One things for sure he doesn’t lack courage. Here he is stumbling across the Royal Marines on Woodbury common aged 4 months and he didn’t take a backward pace. I must also give my thanks to my friends Angie and Graham Collins who looked after Drake (Previously Larry) for me while I was raising the E litter. Here is Angie with Drake ( Previously Larry) second left with all the other pups at the Devon county show. He has grown up with my female Ella and we are both going to miss him. I am certainly considering using him at stud with Ella when she comes into season in March. Mark will be the perfect handler for Drake. I wish them both luck and I hope to do a follow up blog in 6 weeks’ time to update you on how all the teams are getting on. Hopefully the course will now proceed with no further changes. The bond between Phil and Sydney is one of the strongest I have seen. They have been inseparable since I allocated him to Phil aged 15 weeks. Over the months they have been together Sydney has been confident with everything he has encountered. This has included all types of shiny floors and going up and down escalators. So seeing Sydney having a problem with different floor surfaces on the Initial course did come as a shock. Sydney did have a traumatic few weeks before Xmas after an operation to remove a dew claw developed complications and I suspected Sydney would be badly affected being parted from Phil. Sydney went to his new handler Tom Bond a week before the Initial Police dog course started and knowing Sydney as I do living in the kennel block at HQ would have come as a culture shock. We immediately took him back home to puppy walker Phil to settle him down just in case he was suffering from stress caused by his separation from Phil. Phil tells me he seems to be back to his old self. Phil will be meeting me next week with Sydney and we will see if he still has a problem going onto different types of floors. If he is happy going onto certain floors with Phil then we can conclude the problem was stress and we can manage that in future. I will update everyone in my next blog. From Ella and me see you next time.